Sometimes Jesus seems to speak in riddles. When he says (Matthew 5:13-20), “You are the light of the world… If you light a lamp, put it on a lampstand, so it can give light to the whole house…” We get it. Light is meant to be seen. Jesus is telling us that when we let God’s light into our lives, then it can shine out into the world around us. Jesus goes on to say, “Do not think that I have come to abolish the law or the prophets; I have come to fulfill the law. So I tell you, unless you are more righteous than the scribes and Pharisees, you will never enter the kingdom of heaven.” Is he saying we need to keep the law in every particular? Is he saying we need to be perfect to enter the kingdom of heaven? And if he really means that, how can we do it? How can we live perfectly? We can’t. Since no one is perfect, every religion offers a way back home when people stray from their spiritual guidelines. For Jews, Yom Kippur – Day of Atonement – is the holiest day of the year, a day to fast and atone for the sins of the past year. For Muslims, Ramadan is a month of fasting, along with prayer, holy reading, and almsgiving. For Christians, Lent is six weeks of prayer, fasting, and other ways of self-denial. There seems to be a human need for repentance and atonement: Jewish tradition calls for 25 hours of fasting and intensive prayer on Yom Kippur, and much of this time is spent in synagogue services. Even secular Jews, who not observe any other Jewish custom will refrain from work, fast and attend synagogue services on Yom Kippur. Rabbis report around the world that attendance soars on Yom Kippur! And in Christian churches, Lent is still the time of year when clergy can get more people to come to worship, take on special disciplines, and even turn up for extra study. In our first reading (Isaiah 58:1-12), the people are gathering for their days of fasting and repentance. The reading begins with God speaking to the prophet. God tells Isaiah to be a trumpet, a shofar, to call people to repentance: Shout out, do not hold back! Lift up your voice like a trumpet! Announce to my people their rebellion, to the house of Jacob their sins. Look, you serve your own interest on your fast day. and bring the homeless poor into your house? then your light shall rise in the darkness and your gloom be like the noonday. Both Isaiah and Jesus are telling us that the purpose of fasting, prayer and self-denial is not to help us feel better about ourselves. And even the most rigorous spiritual disciplines will not give us a ‘get out of jail free card’ so we can keep doing the same old thing. The goal of any spiritual discipline is to let God’s love rule, let God’s light shine – in us and in the world around us. But we get so used to our old ways of doing things – our patterns of worship, our practices of self-denial, even our charities – that we get stuck in them. All of us – Christians, Muslims, Jews, Buddhists, everyone. We are like players in an endless Monopoly game, thinking that if we go around the board again, we will be rewarded with more money, more possessions, more happiness. That will show that God accepts us and blesses us with good things! Even when Isaiah and Jesus, in their wisdom, tell us that’s not how the world works… we still keep trying to play the same old game. I think this is the reason why Jesus seems to speak in riddles. Riddles and parables put things together that don’t belong together, even things that are impossible together. Things like our flawed, imperfect selves, and a kingdom that only admits the perfect. The word we translate ‘perfect’ in the gospels does not mean flawless – it means complete. And to be complete is to be fulfilled – and for human beings to be fulfilled they must turn outwards to others, rather than turning inward to themselves. Jesus wants to shock us into a new reality – of what it really means to be fulfilled as human beings. Isaiah also wanted to shock people into a new reality. But when Isaiah used his voice like a shofar – trying to blast people awake with the trumpet – could it be that the people were people were used to the shofar blowing (always an integral part of Yom Kippur). How can people hear something new? For our English ancestors, the call to prayer came not with the blowing of the shofar but with the sound of church bells. When I first came to St. Paul’s Church in Cambria, Loren was the chief usher. Loren was a former PG&E lineman, used commanding large groups of men installing electric lines across Southern California. Loren ran his ushers’ crew like he ran the PG&E crews, and he rang the bells with the same precision: first he rang the bell 10 times, then waited several minutes…. 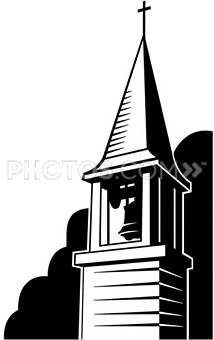 Then he rang it 10 again, followed by another wait……….At the precise moment worship was to start, he rang the bell 3 last times! After I had been at St. Paul’s for a while, I got up my nerve to ask Loren how he knew when to start ringing the bells. I was sure there was a precise formula that he followed, but I couldn’t see him checking the clock… And I was right – no clocks were involved. Loren began to ring them when he heard the bells of the Baptist Church several blocks away – and he instructed the other ushers to always ring the Episcopal bells louder! But whenever Loren saw someone approaching the church who needed help with the steps – even in the middle of his precise bell-ringing – he stopped what he was doing and went to help. Yes, the routine of the bells was important to Loren, but the needs of people always came first. and then God will like you better. But what if the church bells could sound not a call to duty but a call to joy? What if church bells could become, not a reminder of looming punishment but a reminder of God’s overflowing love? And what if praying together under those bells could bring people gladness, taking them away from their own imperfections and into the great love that God has for them? Most important, what if their bells could turn people from worrying about their own sins to worrying about the needs of others? for schemes are vain and fretting brings no gain. Reply, reply, reply with love to love most high. but to be led to where God’s glory flashes, God’s beauty to come near. For is not this the fast that I have chosen? To fight, to fight, to fight ‘til every wrong’s set right. and wrongs redress, who build the old waste places, and in the darkness shine. Divine, divine, divine it is when all combine! God’s glory bright, your way through life adorning; and love shall be the prize. Arise, arise, arise! and make a paradise!